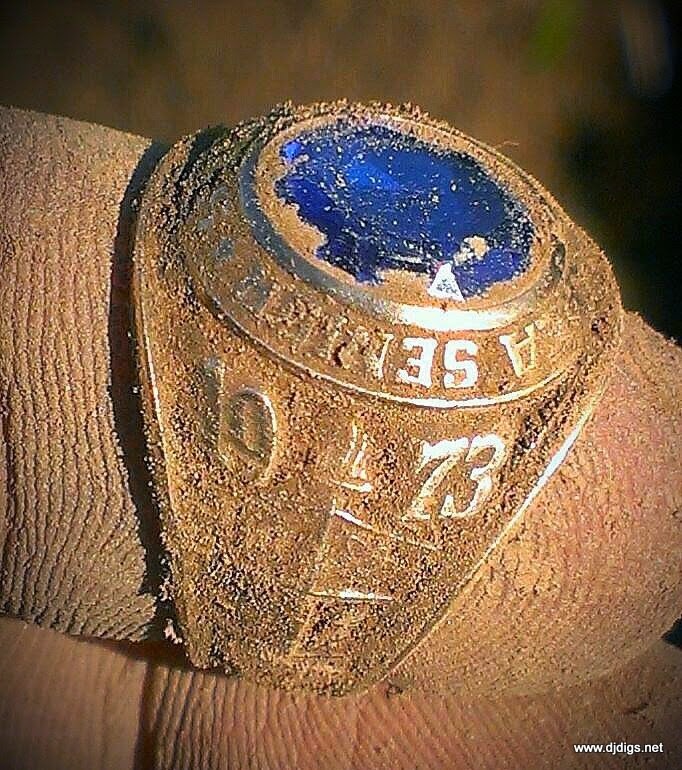 Today I had a wonderful opportunity - I returned a 1973 high school class ring that was lost 41 years ago. I found it at my friend's mom's house and tracked down the rightful owner by using the initials engraved on the ring, an old high school yearbook, and then finally a facebook reunion group for her class. Someone who knew her contacted another friend, who then contacted her. Her friend said, "Someone is looking for you. Where is your class ring?" She thought it was a strange question, but answered, "In the front yard of my old house, why?" The friend answered, "I think this guy found it and wants to return it to you." When she finally contacted me, she was so excited! She said she thought her friend was pulling her leg. (Now this is the part I really like...) She told me she actually remembers the moment she lost it. She was throwing a football in her front yard and it flew off. They stopped and looked for it, but couldn't find it anywhere. And she had just gotten it, three months before! Well, now we know that she had been looking in the wrong part of the yard. It was actually a ways away from where she thought it dropped. And it stayed buried for 41 years until I came along. Sometimes I can't help but think that things like this are meant to be. 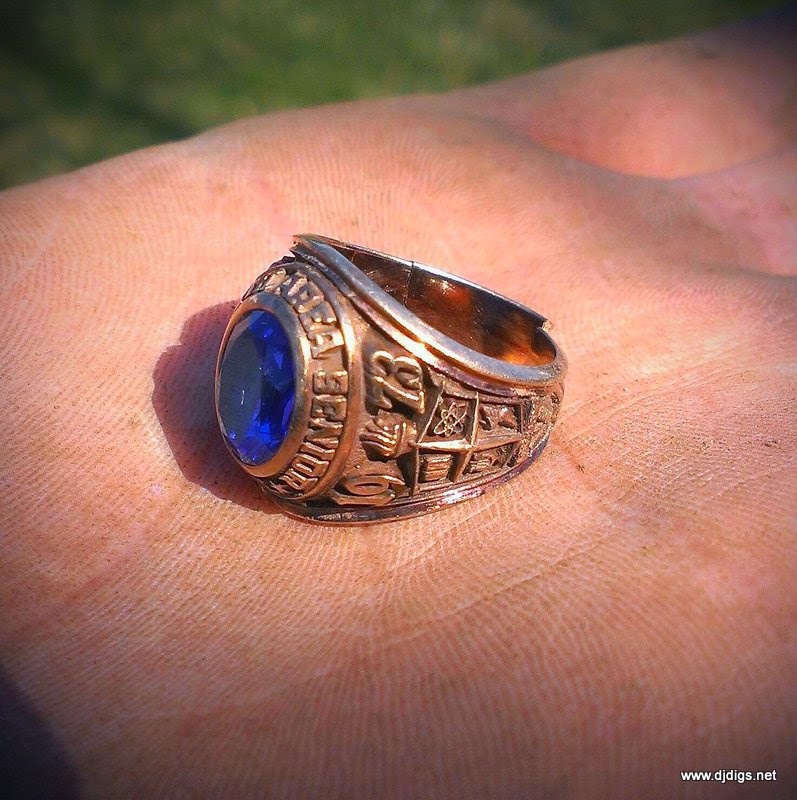 So, the current homeowner, the owner of the ring, and I arranged to meet at the site to return it this afternoon. I think we were all quite excited for the experience. I arrived early (with my detector, of course) and waited for the owner of the ring to arrive. When she did, it felt like I already knew her - and we greeted each other like immediate friends. As we chatted in the driveway of the home where she grew up, I could almost see the memories come flooding back. We approached the front door, and the current homeowner was gracious enough to give us a tour of her home. It was neat to see the inside of a mansion built in 1905, but the greatest part was hearing the ring owner tell stories of growing up in that house. I really enjoyed seeing the joy on her face as she told us about the home. The interior was incredible. The original woodwork was amazing, Italian masons did the stonework on a beautiful original fireplace, and there was a hidden compartment behind a panel in the dining room wall. After our tour (which took at least an hour) it was time to return the ring. You should have seen the look on her face! The ring was just as beautiful as the day she received it, except for a small crack on the band that can easily be repaired. It was great! She was happy, I was happy, and the homeowner was happy. I've returned quite a few lost items over the years, but this was really special. 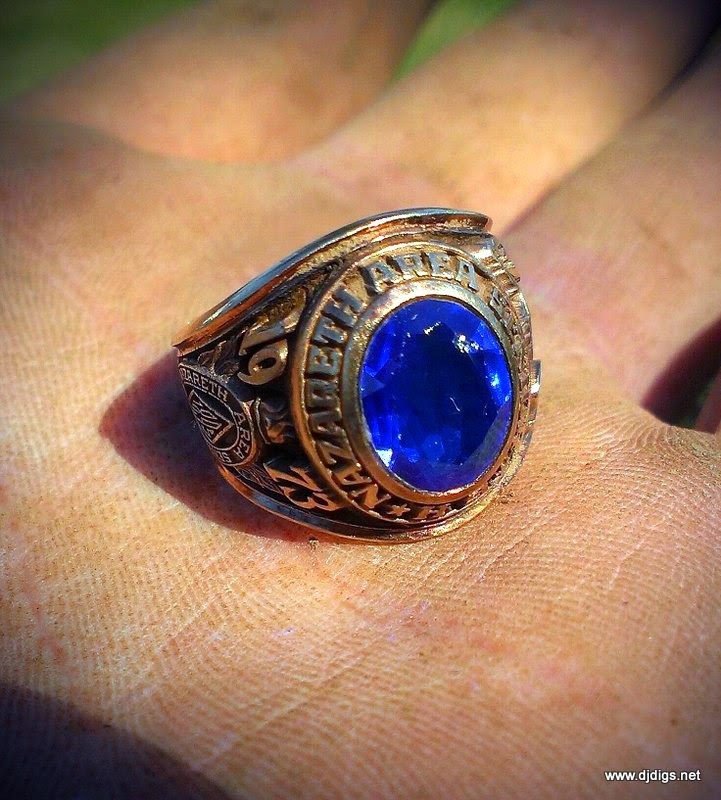 Not only was the ring from my own high school, it was lost for so long, and the item was truly meaningful to the owner. I had the honor of finding it and believe it was my rightful duty to return it. I hope someone would do the same for me. And, as it turns out, I got permission for a new site! She happens to live in a one-room schoolhouse from the 1870's. 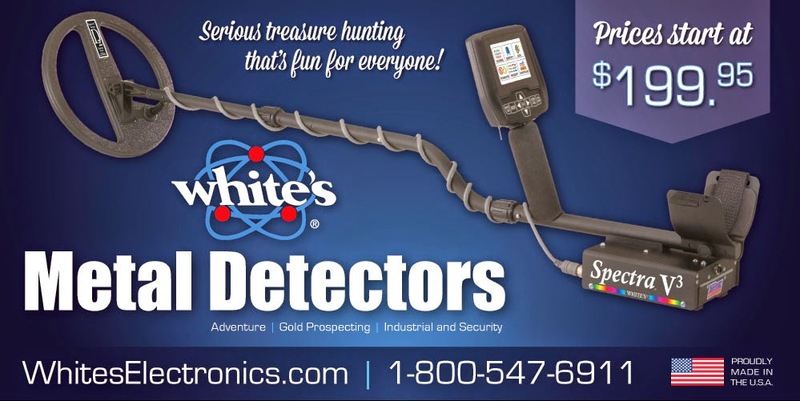 I can't wait to detect it!